This Generic pick gun comes with 3 picking needles,2 straight and 1 offset. 1 double end and tulip long handle tension wrench. One of the best units made at this low price. This same unit is sold for much more at other vendors. 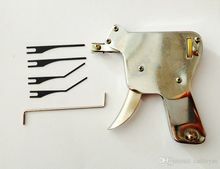 This generic Pick Gun is one of the fastest ways to open up most common pin locks (the kind on your front door) Many police departments and other professionals use this tool to open doors quickly and easily with a minimum of training. This unit is made of steel and has a one year guaranty from the manufacturer. Replacement picks are also sold on this website. This item may only be shipped to the cardholder at the billing address, no other addresses are allowed.